Ford Cemetery is located at 602 Fountain Parkway in Tarrant County (Sunnyvale Avenue in Dallas County), northwest of Fountain Parkway’s intersection with 110th Street and approximately one mile east of Highway 360. 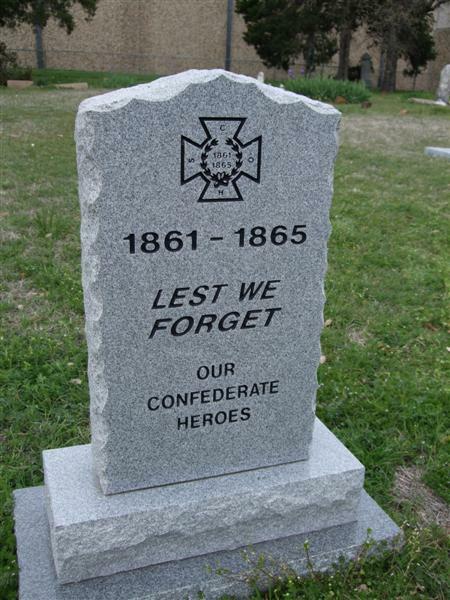 GPGS sincerely thanks Tom and Elena Cogdell for recording and photographing Ford Cemetery in March 2010. The cemetery takes its name from Pinkney Harold Ford who designated the site as a cemetery for his family and neighbors and owned the land for the three decades in which the majority of the burials took place. 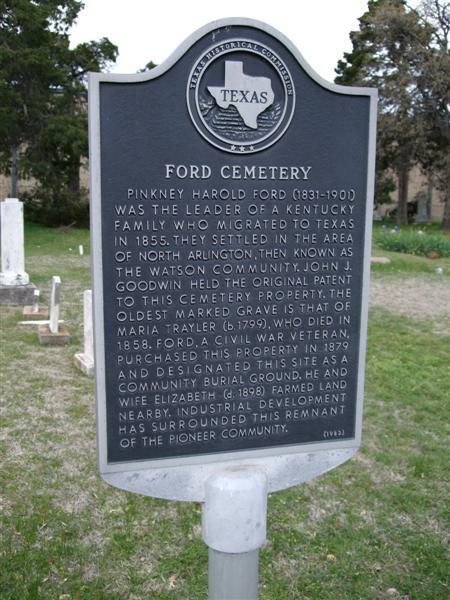 The cemetery marks the location where the Ford family settled for two generations, as well as the burial place of members of several of the pioneer families of north Arlington and Grand Prairie. The rural community used this cemetery for almost a full century, leaving approximately fifty legibly marked graves. Although an abundance of illegible sandstone markers indicate other early graves, the oldest marked grave is that of Maria Trayler who was born on March 11, 1799 in Kentucky, and came to Texas in 1854. 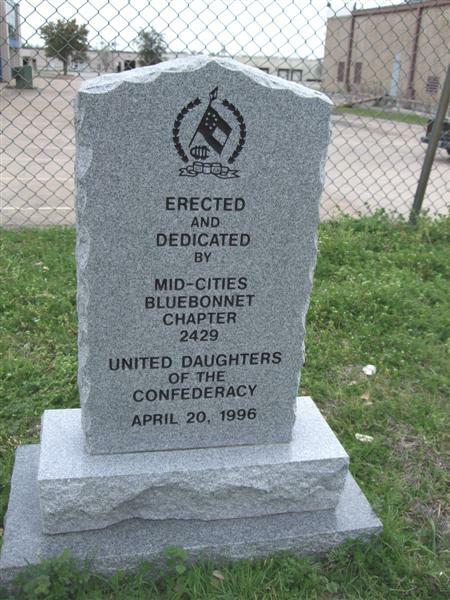 She died on June 7, 1858. The last marked grave is that of Eliza C. Lasater, born in 1876 and died in 1942. Buried in the northeast corner of the cemetery are Pinkney Ford, who donated the cemetery property, and his wife, Elizabeth. Mr. Ford, although primarily a farmer, used ox-drawn wagons to freight provisions from Galveston to the military outpost at Fort Worth. He served as a mounted volunteer in the Johnson Station Rangers during the Civil War. Following the war, he took an active part in the development of the Watson Community. On August 14, 1879 he was ordained as an elder of the Good Hope Cumberland Sabbath School of Watson Community, the only religious congregation in the immediate area. Pinkney Ford acquired the property on which the cemetery is located from the estate of Dr. W. A. Jackson who had purchased it in 1873 from John J. Goodwin, holder of the original patent. Goodwin was a native of Georgia and the 320 acres in the patent was part of the Peter’s Colony in 1850. 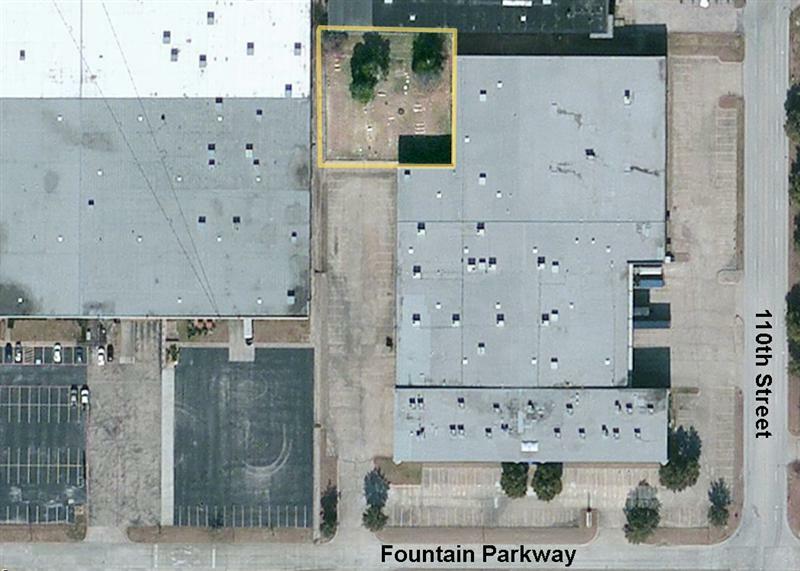 The twentieth century development of the northeast Tarrant County eventually left Ford Cemetery in the midst of an industrial and manufacturing district. This cemetery is rectangular, extending about 120 feet north-south and 135 feet east-west, surrounded by a chain link fence about four feet high. There is a small gate on the south side and a gate for equipment on the north side. Nearly surrounded by warehouse buildings of the Great Southwest Industrial District, parking is available in the lot on the west side of the warehouse at the southeast corner of the cemetery. 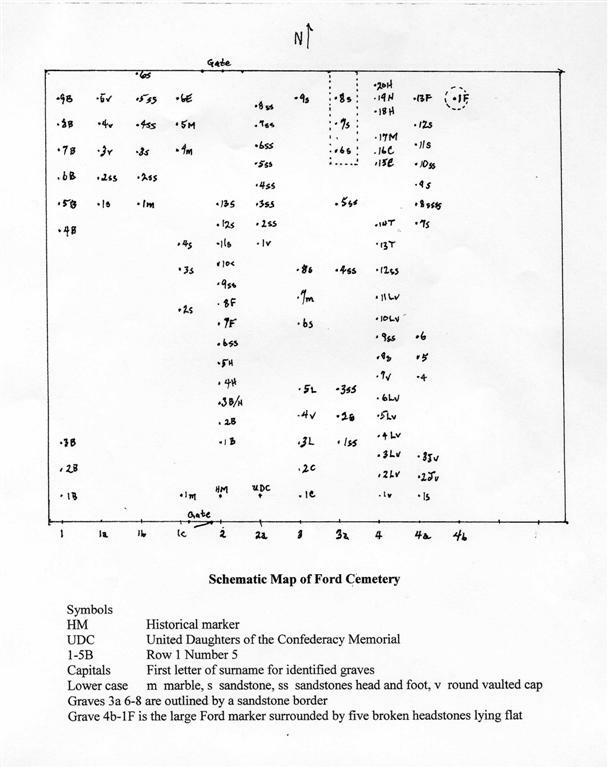 As seen in the google image, there are four principal rows of graves oriented north-south. These have been numbered on the map from 1 on the west to 4 on the east designated 1a, 1b, and 1c. Graves are numbered on the map south to north in each row or partial row. Thus the grave of Raford A. Bellomy in the southwest corner is 1-1 and the large marker for Pinkney H. Ford and wife E. E. Ford in the northeast corner is 4b-1. There are a number of domed concrete covers, some of which have no inscription and no separate marker. Others, such as those for the Lasater family, have headstones with complete vital information. There are several graves for which the headstone is broken off and in some cases these have been moved to the northeast corner of the cemetery and lie flat on the ground around the large P.H. Ford column. The original location for some of these can be inferred from footstones bearing their initials. Finally, there are many grave locations, particularly in the short rows, marked only by rough sandstones, many of them in pairs, which are often closely spaced, as for a child. J. W. Dunlop, who surveyed this cemetery in 1998, counted these as 49 unmarked graves. Any count would be uncertain but we have noted these m for marble, s for sandstone and ss for pairs, rounded vault caps are designated V on the drawn map.